Michelle Fee, author of 10 Stylish Options for Shower Enclosures, says “We’ve all seen or lived in a home with the ever-so-famous enclosure framed in polished brass, but there are tons of other options”- some of her suggestions are listed below. 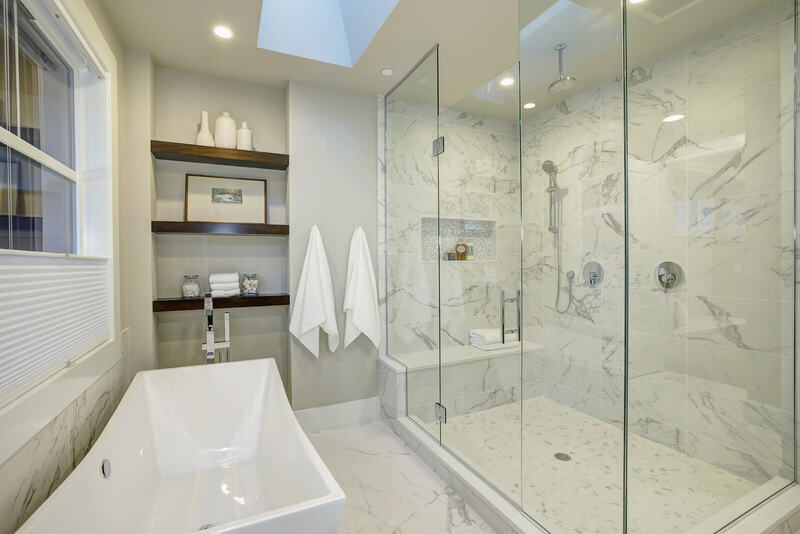 Colorado Glass Solutions of Longmont has years of experience installing all types of glass shower doors and can help design the best choice for your bathroom. Frameless glass shower enclosures compliment any design style from modern to traditional. There is also a repellent finish available that prevents soap scum and water spots from sticking to the glass and makes it easier to clean! Aluminum framed enclosures provide contrast between the dark metal and clear panels. This choice will definitely draw attention to the shower, and may appeal more to those who want a more urban or industrial feel in their bathroom. Sliding glass doors are a great option where space restrictions prevent a swinging door from being installed. The hardware on sliding doors add an element of interest as well! Textured doors provide privacy while not being as opaque as frosted glass, and add an element of beauty that is enhanced when water runs down the panels. Multiple entrances to the shower area are also possible with just one sheet of glass in the center. This set up gives the most open feeling, the opposite of the next option. Combination tile and glass enclosures make the shower into its own private room. Tile will be highlighted when it goes from floor to ceiling but natural light will still illuminate the shower with a glass door and/or windows. Tub enclosures with a hinged panel of tempered glass look much more stylish than shower curtains, and still do the job of keeping water inside. They are also very durable and will not break if bumped against a vanity or toilet. Whether you are remodeling your entire bathroom or would just like to replace an outdated enclosure, come to Colorado Glass Solutions in Longmont for a wide variety of glass shower doors!